This is the list of basic sparring gear required, and links to the preferred vendors for each product. Karate Gi (BLACK) – Students practice in black, as it is easier to keep clean. Brown belt and above test in traditional white uniforms. Pants have an elastic waist band with drawstring for perfect fit. Set includes pants, jacket and a white belt. Punches (WHITE) – These gloves feature a vinyl construction with an open finger design, giving you more control and hand flexibility. 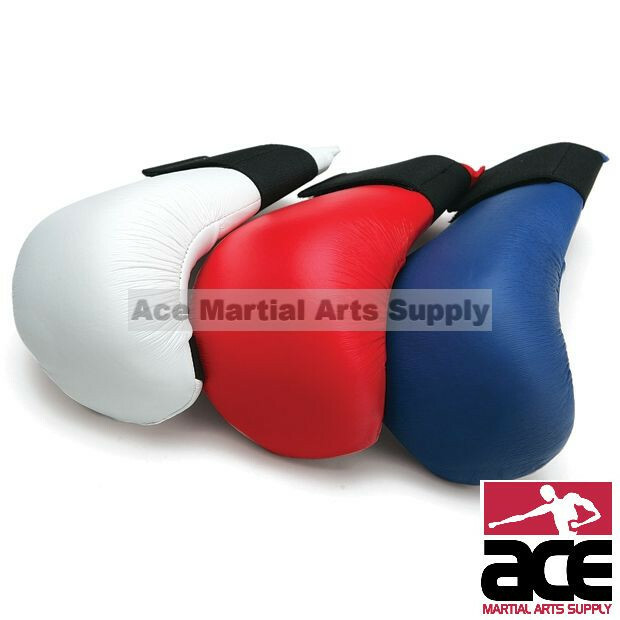 They feature an easy to use hook-and-loop closure for an easy self adjustment during your sparring and training sessions. National level competition requires red or blue gear. 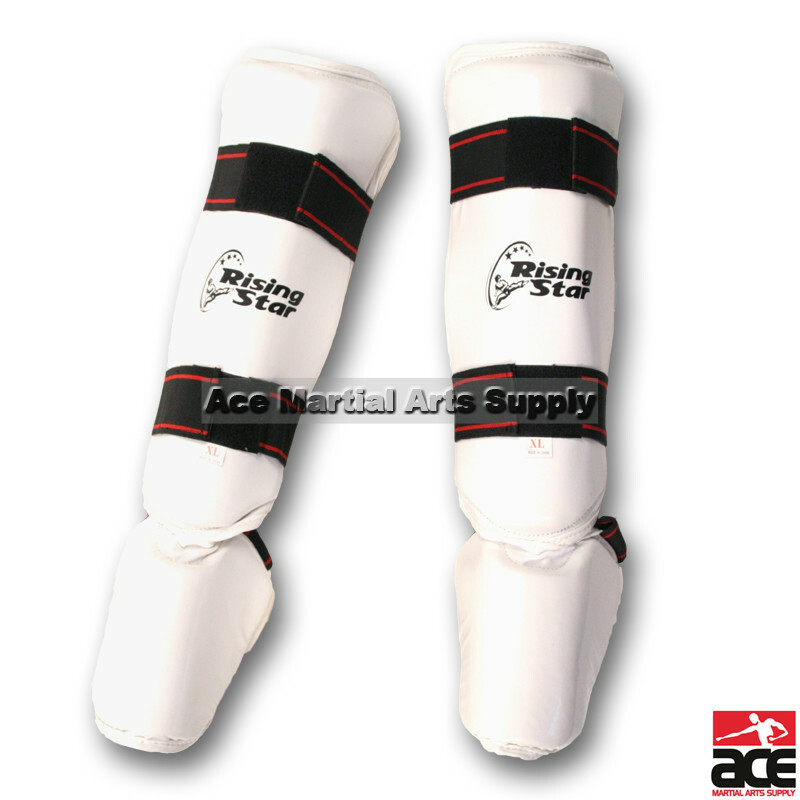 Shin/instep gear – This shin instep guard is sold in pairs and it absorbs shocks and prevents any harmful injury during practice. Reinforced vinyl for durability. Each shin instep guard comes with two 1.5 inch wide elastic straps with a hook and loop closure. Helmet w/ Face shield – This piece will help protect the head and face. Complete protection of your entire head, including the cheek and jaw areas, without the “fogging” problems that occur with most other types of shields. Head gear (white preferred) – Designed to allow maximum ventilation without losing protection on top, sides and back of head. Made of high quality 3/4″ thick dipped foam. MTI Swift sparring gear comes in 10 colors. Mouthpieces – Mouthpieces are an essential part of any sparring set. Choose from multi colored single mouth guards to double mouth guards for adults and kids. Remember to grab a case for your mouth guard! Cup and supporter – A necessary piece of protection when training and sparring. The hard plastic cup can be removed for cleaning. Available in youth and men’s sizes. Comes with an elastic waistband. Want to learn the Rules for Kumite (Karate fighting?) – click HERE to be taken to the Online Resources page for lots more info! Sensei Tony Johnson is a driven and inspired individual focused on excellence. If you are looking for an easy, or fast way to learn Martial Arts, look somewhere else. Tony Johnson offers instead a top-to-bottom holistic approach to teaching that will give you skills fit for the rest of your life.